The Bachelor of Science (BS) degree provides an intensive coverage of the field for the student who desires to become a professional chemist. The BS program prepares the student for entry into graduate programs in Chemistry leading to advanced degrees or for direct entry into the job market at the baccalaureate level. 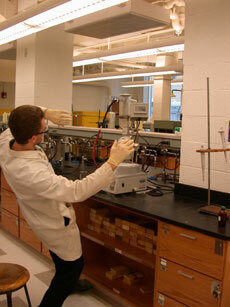 Many of the CWRU BS Chemistry majors are highly recruited by the top national PhD graduate programs. The Department of Chemistry is part of the College of Arts and Sciences at Case Western Reserve University. As common to all degree programs within the college, the BS degree candidates must fulfill 39 credits of coursework for the SAGES requirements. An additional 53-54 credit hours must be accumulated in chemistry courses. Additional credits of math and science courses must also be taken. The remaining credits are available for electives to allow the student to either specialize in areas of interest or predefined “tracks” of coursework that specialize in select subareas of chemistry. The BS degree in chemistry at CWRU meets all of the requirements for being an American Chemical Society (ACS) certified degree. The sequence of required chemistry courses for the BS degree described above represent a “core set” of chemistry courses comprising 47-48 credit hours. In addition to the “core set” of required chemistry courses, the BS major will be required to complete an additional 6 credit hours of chemistry electives and 6 credit hours of technical electives. The chemistry electives may be any chemistry department course at the 300 level or above which is not part of the “core set”, or selected courses with a strong chemistry content at the 300 level or above from other science departments. Only 3 credit hours of CHEM 397 may be applied to a chemistry elective. The technical electives may be chosen more widely from any of the natural sciences, math, or engineering courses. An additional 6 credits of CHEM 397 may be taken as technical electives. Further additional credits of CHEM 397 may be taken as Free Electives. Students may wish to group their electives into “tracks” of specialization in order to tailor their degree to a particular area of chemistry. The recommended sequence of science and math courses required to complete the BS program will help you plan your academic career. You may also find a complete listing of chemistry courses helpful in your planning.